The BRS film, made together with partners WECF and WEP and premiered at UNEA-3 in Nairobi last month, is screened on Nigerian International TV (NTA) on Monday 15th January at 1730 local time. The State of Palestine has acceded to the Stockholm Convention, depositing its instruments of accession to both the Stockholm and Rotterdam Conventions on 29 December 2017, with entry into force on 29 March 2018. The advance English version of the report of 13th meeting of the Persistent Organic Pollutants Review Committee is now available online. 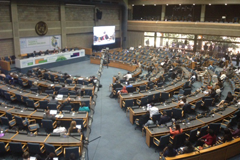 Whilst key resolutions were adopted at the UN Environment Assembly yesterday in Nairobi on marine litter, air and soil pollution, and environment & health, BRS staff took to social media to show their support. If you were not in Nairobi and could not watch it live, you can now view the recording to hear all about new innovations, interventions, questions, and discussions. During an intensive period at UN Environment HQ in Nairobi, the BRS Secretariat has organised a side event together with the governments of Germany, Mauritius and Uruguay. Also addressing amendments from COP-4, COP-5 and COP-6, the Russian Federation has transmitted its initial NIP. To Rid the World of POPs, and incorporating amendments from COP-6 and COP-7, Czechia has transmitted its updated national plan or NIP. The BRS Secretariat is proud to be a founder member of the Steering Committee for the UN Global Science-Policy-Business Forum on the Environment, meeting for the first time at UNEA-3 in Nairobi, 2-3 December. Ridwan Tamin, Indonesia, talks to the Secretariat in the latest in our series highlighting the 26 BRS Regional Centres. Data collected and submitted by Parties in their national reports can be used in multiple ways, as demonstrated by new research showing declines in DDT production and use. The Rotterdam and Stockholm scientific subsidiary bodies’ meetings - CRC13 and POPRC13 - successfully concluded recently in Rome, and the official Press Release is now online. Together with IUCN, the BRS Secretariat publishes new research showing progress on mainstreaming gender into the work of the 3 chemical conventions. To rid the world of POPs, Nepal has transmitted its updated National Implementation Plan, addressing amendments made by COPs 4, 5, & 6. The Strategic Approach to International Chemicals Management – SAICM - invites all stakeholders to share their views through an online survey on information needs. Experts attending the forthcoming scientific meetings of the Rotterdam & Stockholm conventions can download our updated App. The Conference of the Parties of the Basel Convention in 1995 selected Indonesia to host one of the Basel Convention Regional Centres. Subsequently, a Framework Agreement was signed in 2004 to this effect. The same Centre was endorsed by the Conference of the Parties of the Stockholm Convention in 2013 as a Stockholm Convention Regional Centre for an initial 2 years, extended for another 4 years by COP.7. E-waste Training Workshop for Asia and the Pacific, 10-14 Aug 2009, Hanoi, Vietnam. Regional Workshop for the Environmentally Sound Management of e-Wastes, 13-15 Mar 2007, Siem Reap, Cambodia. Development of e-waste data base in cooperation with UNEP/SBC. Workshop on Technology Transfer to Mercury-Free Gold Recovery, Pacitan Regency, Indonesia, 21 July 2016. Regional Workshop for the Environmentally Sound Management of Asbestos Containing Materials, 19 Dec 2006, Jakarta. Parties served: Brunei Darussalam, Cambodia, Lao PDR, Malaysia, Myanmar, Philippines, Singapore, Thailand and Vietnam. For more information visit: www.bcrc-sea.org. Sudan has transmitted its updated National Implementation Plan (NIP), addressing amendments made by COPs 4 and 5.